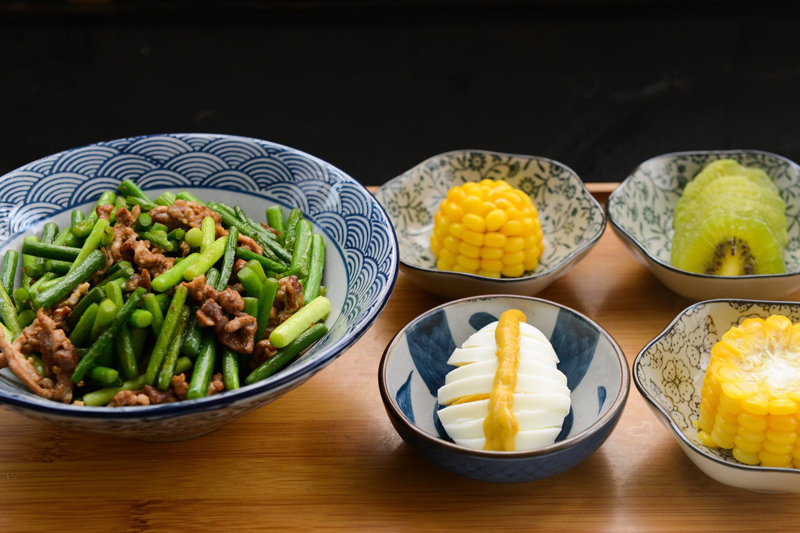 Buddha’s delight is a traditional Chinese vegetarian dish that is usually served during the Chinese New Year. This delicious mix of symbolic vegetables and noodles is meant to bring joy, health and happiness to the new year. Try this delicious Buddha’s delight recipe and let me know what you think in the Chinese food forum. Enjoy! Soak the bean curd sticks, black mushrooms, golden needles and bean thread noodles in hot water for about 30 minutes or until they soften and reconstitute. These should each be in individual bowls. While these soak, prepare the other ingredients. Thoroughly drain the cans of bamboo and water chestnuts and set half of them aside, reserving the other half for another recipe. Peel the carrots and cut off their ends and discard. Then cut them into round slices and set them aside. Rinse the cabbage leaves under cold running water and dry them with paper towels. Then cut them into large pieces and set them aside. Rinse the snow peas under cold running water and dry them thoroughly. Pinch off the ends and remove the strings that run along the sides. Then set them aside. Using the side of a knife, carefully smash the garlic and then peel it. Mince it into tiny pieces and set them aside. Peel the ginger and then grate it with a micro plane grater and set it aside. In a large cup mix together all of the ingredients for the sauce making sure that the cornstarch dissolves thoroughly. Then set this mixture aside. Check to see if the mushrooms, golden needles and bean curd sticks have expanded. Then drain them and squeeze them out to remove all of the excess water. Remove any tough stems from the golden needles and Chop the mushrooms into small pieces. Now it’s time to start cooking. Heat a wok on high. Once it’s hot add the stir-fry oil. Keep in mind that stir fry oil has the flavors of ginger garlic and green onion already infused into it. When the oil is hot add the ginger and garlic and stir-fry them for 20 seconds. Then add the carrots and snow peas and stir-fry for another 30 seconds. Then add the bamboo, water chestnuts, golden needles, bean curd sticks, and mushrooms and stir-fry everything for another 30 seconds. Then add the cabbage and the sauce and cover. Turn the heat down to medium and let everything simmer, stirring occasionally for about 3 minutes or until the cabbage is soft. Next add the bean thread noodles and gently stir to mix them in. Toss everything together until it is coated with the sauce and heated through, about 1 minute. Then you can remove it from the heat and serve. Makes 3 to 4 servings.